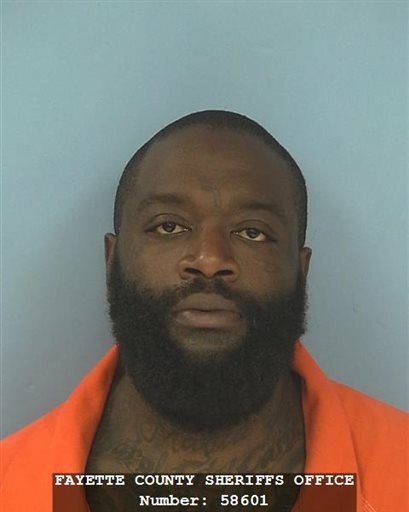 ATLANTA (AP) — Rapper Rick Ross is accused of forcing a man into a guesthouse at his suburban-Atlanta mansion and beating him in the head with a handgun, chipping his teeth and mangling his jaw so badly that he’s unable to chew food, authorities say in court records. Ross was taken into custody Wednesday by a U.S. Marshals Service fugitive task force and sheriff’s deputies at the mansion in Fayette County, south of Atlanta. Ross, 39 — whose real name is William Roberts — was jailed without bail on kidnapping, aggravated assault and aggravated battery charges, said Jim Joyner, a supervisor with the Marshals Service task force. Ross’ bodyguard, 42-year-old Nadrian James, faces kidnapping and aggravated battery charges stemming from the same incident, arrest warrants state. The June 7 attack left the man with injuries that included two chipped teeth and a neck injury, authorities said. “The victim lost use of his jaw and is restricted to soft foods and liquid diet only as a result of not being able to chew food,” an arrest warrant states. Ross and James are both accused of forcing the man into the guesthouse, down a hallway and into a bedroom, resulting in the kidnapping charges. Both are also accused of assaulting him. Ross also faces an aggravated assault charge involving a Glock handgun. He’s accused of using the gun to strike the man in the head and body, and also pointing the weapon at him. “The victim was then questioned under duress and forced to answer questions at gunpoint,” one of the arrest warrants states. The court papers do not indicate what led to the attack, nor do they outline the relationship between Ross, the bodyguard and the man who was injured. It wasn’t immediately clear whether Ross and James have attorneys who could be contacted for comment. A message left at Maybach Music Group, Ross’ record label, was not returned Wednesday morning. When officers armed with the arrest warrants showed up at the mansion, once owned by boxer Evander Holyfield, someone inside refused to open the gate leading to the home, authorities said. “They refused to open the gate, so we opened the gate for them,” Joyner said. Once officers got past the gate, someone inside opened the front door so they didn’t have to break it down, Joyner said. Ross and the bodyguard were then taken into custody without incident, Joyner said. “They didn’t put up a struggle or anything,” he said. Ross made an initial appearance before a magistrate judge Wednesday morning and the judge denied bail, Fayette County sheriff’s spokesman J. Allen Stevens said. It was second time in the past two weeks Ross has been arrested in Fayette County. On June 10, Ross was booked into the county jail on a misdemeanor charge of marijuana possession. In that case, Ross and a passenger were pulled over because the windows of the Bentley in which they were riding violated tinting regulations, Stevens, the sheriff’s spokesman, said at the time. The officer smelled marijuana and found some inside the car, Stevens said. Of Ross’ seven albums, five have debuted at No. 1 on Billboard’s Top 200 chart and four have reached gold status. A Florida Department of Corrections spokesman confirmed Wednesday — and Ross has previously said — that he worked as a correctional officer at a Miami prison in the mid-1990s. The department supplied a record showing Ross worked at an institution called the South Florida Reception Center from Dec. 29, 1995, through June 16, 1997. Tags: arrested, kidnapping, rapper, rick ross, warrants. Bookmark the permalink.